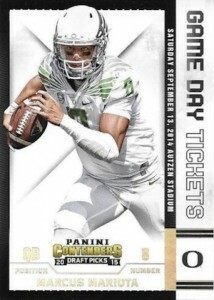 2015 Panini Contenders Draft Picks Football kicks off the company's NCAA near-exclusive trading card deal. Like the main NFL brand, autographs are the key element. Hobby boxes come with six signed cards with a large focus on players heading to the 2015 draft. Instead of the standard Rookie Ticket Autographs, it's College Ticket with Bowl Ticket, Playoff Ticket, Cracked Ice Ticket and Championship Ticket parallels. Given the popularity of the Contenders brand, one would have to expect draft players to appear in the NFL version later in the season. Current NFL player autographs appear in Alumni Ink and Old School Colors. Given this is a college set, they're pictured in the NCAA uniforms. Among the signers are Tom Brady, Drew Brees, Peyton Manning and Tony Romo. Collegiate Connections Signatures pair players who went to the same school. Among the combinations are Andrew Luck with Richard Sherman, and Aaron Rodgers and Marshawn Lynch. In addition to the six autographs, 2015 Panini Contenders Draft Picks Football hobby boxes have 48 total inserts and parallels. 163 cards. Short prints are noted below. SP = 250 copies or less, SSP = 50 copies or less. All players are not included in each parallel. View the spreadsheet for specific print runs and full checklist. 47 cards. Find out how to spot the variations. 105 cards. Short prints are noted below. 132 cards. Short prints are noted below. 60 cards. Short prints are noted below. 15 cards. All cards in the set are super short prints. SSP = 50 copies or less. 25 cards. All cards in the set are super short prints. 10 cards. All cards in the set are super short prints. 47 cards. All cards in the set are super short prints. 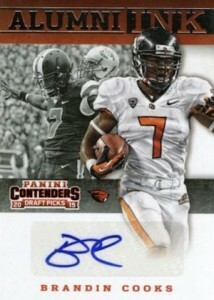 Can we expect Panini to include Points instead of autos in this product? 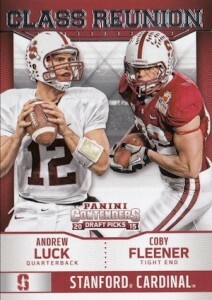 I wish they would just make the “College Ticket” a parallel version in the regular set like they did back in 2009. I personally think this new draft picks set will take away from what has been a strong and popular NFL product. due out in a day and no checklist yet ? patrick � It appears to have been pushed back again, due out next week now. Why did they push it back? Nicholas � Not sure. Likely some elements like autographs weren’t ready to go. 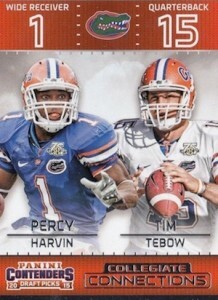 Guess this is yet another Panini product I will not be buying on release day if at all due to no checklist. Seriously? (Not you Ryan, you’re awesome) The product is in transit to stores and/or distributors, come on Panini. Are yall taking a cue from Obamacare? We just have to buy it to see what’s in it? Sorry I really don’t care about a bunch of 5th-7th round pick auto’s. Kurry F � It looks like it has been pushed back again (third time in three weeks), this time to May 20. Who’s paying that much for a box of this product? Ripoff. 6 autos of guys nobody’s heard of and not a numbered card in the box??? Customers not too happy with their breaks. 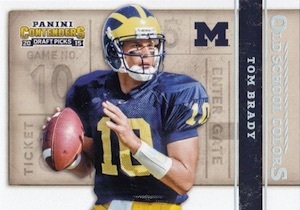 This is not a replacement product for the legendary Contenders Football, quite arguably the single most desirable and sought Football Rookie card still being produced. This release is intended to be a complement to the Contenders NFL product. I’d crap myself (figuratively, of course) if I pulled an autographed reprint of Peyton Manning’s ’98 Contender auto rook’, one of the most important rookie cards since the 60’s and a still quite viable investment card. This product is not for everyone, but the draft’s big names are here and their auto’s issues are already commanding impressive sums. If this isn’t your red solo cup of affordable beer, have no fear as the release of “Prestige” is right around the corner. I have ready found the difference in the variations. 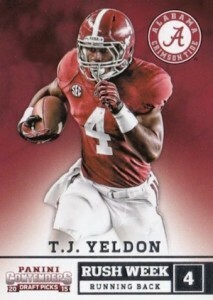 If the Player on the card has his jersey number as the seat then it is the standard card and if the players number is in the sec then it is a variation. Not 100% sure, but that seems to be the constant at least in the box bought. I really love this product. Also, how doy you determine the different photo variations and which ones are more limited. Any idea if this will be retail or just hobby? Just finished breaking the newly released 2015 Contenders Draft Picks from Panini. Ive got to admit that it was a very sweet product indeed with plenty of hits in the Hobby Box. We cracked open a half case of it and also a smaller break of just 2 boxes and all teams were represented quite well with exception of Jets, Titans, and Rams. But even with those three teams not having a lot of base or inserts in the 8 boxes total that I opened it still had the autos for the newly drafted players. 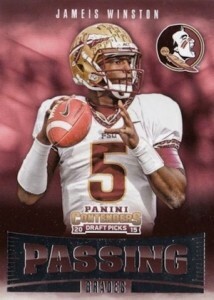 Over all it seems like Panini did a fair shake for all 32 teams and their newbies that are as we speak trying to make that next step as a NFL player. I did notice that even though the breakdown of the product highlights states there are 6 autos in every box and the box shows 5 autos in the box? not sure what that’s about. We did in fact pull 6 autos out of 7 of the 8 boxes with the 8th box having 2 S/N parallels pulled instead and 5 autos. So don’t be disappointed if in fact you only get 5 autos and a couple S/N parallels because it seems the parallels are hard to come by in the product. As stated in the above each team is represented very well and over all this product is a keeper and a nice addition to the Panini product line. Enjoy Spectators and Happy Collecting!!! This is an awful product. Very disappointed. The autographs are cheap duplicates of un-signed free agents for the most part. I participated in a 2 case (24 box) case break. Only 1 1st round draft pick auto was pulled and none of the big 4…Winston, Mariota, Gurley and Gordon were pulled. There is also only 1 alumni auto and 1 school colors auto per case and they came in the same box both times. If you like pulling 6 or 7 autos per box for fun then enjoy…but if you are looking for a nice low number high dollar hit look else where. I’m gonna stick with Panini DK. I love the set, and there are some mega huge hits. I’ll be building 2 Contenders sets this year it seems. Should be more fun than building my SAGE hit set…. Even completing the auto set seemed pointless…. Real NFL cardboard! Yay! After just completing the sage hit master set (auto’s and all) I will be thrilled to start building a real set with shots at some mega hits. Retail blasters 20$ with 2 autos btw, helps the set builders like me. I love the set, ive opened hobby and retail. Good hits, good design (even with the college unis, it IS liscensed ), and a fun multi-level set to build. Should finish it in time for Playoff Contenders NFL! Happy plucking! I just cracked 2 20$ blaster boxes of this. Wayyyy better value than hobby. 4 autos 2 blue foil a red foil and a base. 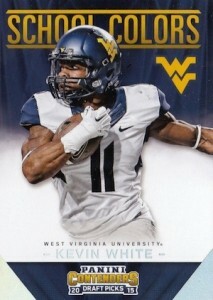 An insert in every pack, along with a school colors, and old school colors. I think it will be much easier to finish my master set by getting 10 autos, and countless inserts for 100$ rather than 5 autos in a hbobby bx. Doesnt seem to hurt ur chance fir a bug hit. Find retail! I received one first round pick autographed 1 3rd round pick autograph into undrafted free agents that have both signed with teams when I bought two blaster boxes. I also got a ton of inserts from clay Matthews Carson Palmer Odell Beckham Jr just to name a few I like this set but I’m afraid it takes away from other panini regular season sets and I feel there are too many insert sets. but I do need to give it 4 stars for the cards that I did receive. Got a taste for the product with a blaster box. two blue foil draft ticket autos, one being a second rounder. Not a bad pull but it feels like the autos are the only thing of value. I guess I’m old school, I like the plain action photos on the field. 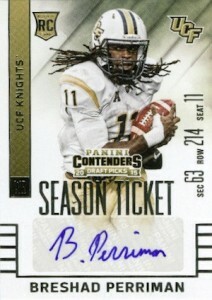 I love the signature cards, I just wish manufacturers would make msp unsigned rookie cards. Maybe even numbered. I think everybody loves seeing the plain rookie Montana bidding up towards 13,000 dollars. It would be nice to bring that back. Bought 2 blaster boxes today just to give it a try, and I was extremely satisfied with what I got. The autographs look great, and I got a good mix of players (2 of them are now on the Broncos!) and I love the mix of different designs and subsets and inserts, they’re all unique and look great. I’m kind of wishing I bought more. Overall these cards look amazing. At least the good thing is that even if Winston, Mariota, etc. can’t be found in blasters, nobody knows yet which 3rd rounder or later could emerge that IS in there. Mike Zink � There has been nothing provided to indicate the retail-exclusive autographs. 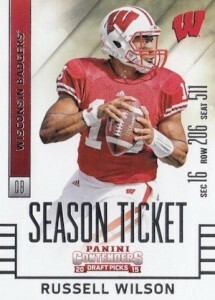 Is there going to be a tab for 2015 Football Cards? Webb � There is 2015 football tab, but it has not yet been added to the home page. Here is the direct link – https://www.cardboardconnection.com/sports-cards-sets/nfl-football-cards/2015-football-cards/ – or you can click on “Football Card Sets” under the main football tab and you will see it. My son bought a blaster box at our local Target, he was excited to see what 2 autographs he got. Only to be extremely disappointed when there no autographs. The cards themselves are nice looking and an insert in every pack is nice but to be shorted both autos, that is poor quality control. Is there a rule, that i dont know about, which states that you can’t name the player that you pulled in a box? seems like a lot more work to put down “I got a second round draft pick that plays for the Broncos”, than to just simply name the player. I Gave it three stars because I have no idea, and that seems to be right in the middle. trying to decide if it’s worth it to buy a blaster box or not and thought I would look on here to see what kind of autos people where pulling out of them. I’m not getting much help,because for some reason people are going out of their way to not name of the player that they pulled. Bought a box a month ago… and would say this is the best box I have ever pulled cards from. Not an avid collector… but I guess you would call me a Personal Collection collector. Anyway I randomly, must stay randomly pulled a Mariota RC auto. Not knowing the value of the card and looked a little closer… Serial # was 23. Signed up for beckett.com and found the true value. Just saying… Holy #*(#$ Now… bringing it back to reality… I know there are avid collectors out there… I do have it listed on ebay. Just getting tired of low ballers bidding. If you bid at the range of the low end of the beckett.com value I will seriously consider. To anyone who purchases or is thinking about buying cards for themselves or loved ones� I do recommend to to purchase the regular box at $130� You will definitely get your moneys $$$$ worth. I just got back into collecting after a long break and picked up a box of these and a few other brands. Of the boxes I got, this was the most expensive by $10 (24 pack box). I didn’t get a particularly loaded box by any means, didn’t get any super rare cards or big name signatures, so that jaded my opinion some. However, I was really surprised at getting not a single duplicate in the whole box and was really satisfied with that. The cards are very nice looking and have all the rookies we’re looking for. I got at least one of all of big name rookies, and 3 total including inserts of Winston, Mariota, and Yeldon. Of the stuff we’re all wanting, I received (5) signatures (biggest name being Abdullah and others that are likely giveaways), (1) /99 card (Le’veon Bell), and (1) /23 signature Cracked Ice (Eric Tomlinson, doh). All in all, I really liked the box and will very likely get another one to maybe finish off at least the base sets and roll the dice again at some bigger cards. The popular opinion seems to be go for the blaster boxes, so I’ll probably try them before getting a 24 pack box again, since set collecting isn’t really my priority. If you’re not going to go for a whole box, this is definitely worth getting a dozen or so packs out of the same box since you’ll likely get 1-2 signatures and no duplicates, with the chance at a big rare. Soooooo maybe I’m just late to the party, but is this the set that replaced Rookies and Stars…and if not where the hell is Rookies and Stars?!?!?! I’m a baseball card guy but after hearing a buddy talk up regular Contenders, I decided to pick up a blaster. The cards are a bit confusing but I pulled a Brandon Scherff auto and a Nick Marshall auto. Both tickets. One of them seems to be a variation as their jersey numbers are in different places. If I got a Scherff variation that would be sweet cuz Ive lived in Iowa City for 16 years. I will probably buy another blaster at some point tonight.